Adding a second best friend to your family means double the fun. The anxiety of leaving your dog home alone is alleviated because they now have a like-minded sibling to keep them company. You’re no longer the greatest thing in the world to just one dog, but two – which means twice the affection! Parenting more than one dog certainly has its benefits but can also be a huge undertaking. In general, you can expect everything to double; your financial investment, time, and training efforts. As you adapt, new challenges will arise, such as having to walk more than one dog simultaneously. Luckily, there are many solutions that can make being a pet parent of two much easier! Taking multiple dogs for a walk can save time and strengthen the bond you share, but dogs (like people) have minds of their own. Without proper training, they can be difficult to control; leaving you feeling pulled in multiple directions. 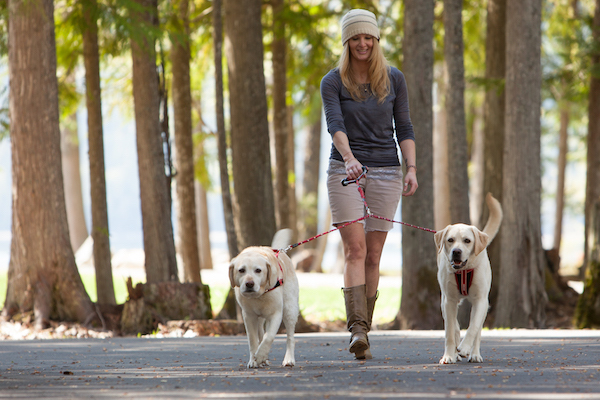 EzyDog offers many solutions to multi-dog walking. In this article, we’ll explore these double dog solutions to help you determine what is right for you and your canine companions. Often times, dogs’ leads can overlap during walks, making them uncomfortable and leaving a big tangly mess for you to unravel. The Double Dog Solution eliminates this hassle and provides a few additional benefits. 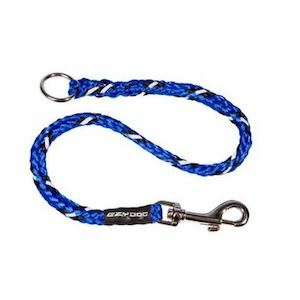 This kit includes one EzyDog Cujo Leash (in either 25” or 40”), which features a swiveling clip, and two lightweight swiveling 24” leash extensions. The Cujo’s pyramid handle provides excellent control and includes shock absorption to reduce strain on you and your dogs. With the flexibility of three swiveling components, your dogs can cross over freely and you can trade in the stress of trying to keep them in line for a nice relaxing stroll. A simple solution for walking two dogs would be to attach a coupler to your existing leash. 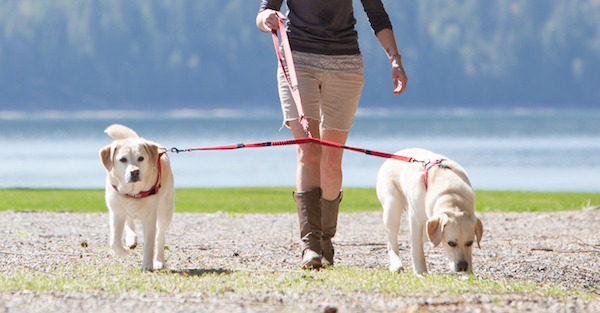 When used with an EzyDog Leash, the EzyDog Soft Touch Coupler turns your leash into a tangle-free double dog walking system. The Soft Touch Coupler also provides reflective stitching, a traffic control handle to keep your dogs close when necessary, and adjustability to allow your alpha dog to be out front. This same design is also available in a “lite” version for smaller dogs under 26 lbs. For many dogs, it’s instinctive for them to pull, which is why the EzyDog Zero Shock Coupler takes things a step further. Each side of the coupler features EzyDog’s patented Zero Shock Technology, which greatly reduces the impact and strain caused by a dog’s pulling. Since each dog is given their own buffer, you and your dogs will be less affected by their unwanted behavior and sudden jolts. 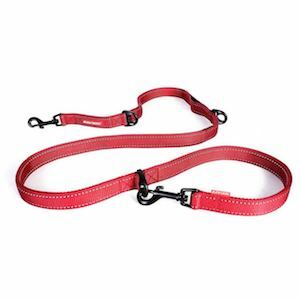 Similar to using a coupler, you can also attach two leash extensions to an existing leash. 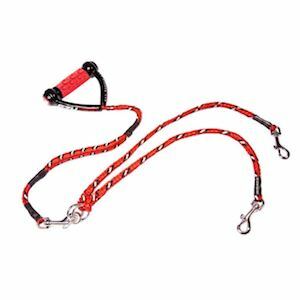 This gives you the option of walking two dogs but also the versatility to extend the reach of your leash for a single dog. The 24” Standard Leash Extensions from EzyDog are an excellent option if you’re looking to go this route. EzyDog’s Standard Extensions can also be used to discourage unwanted behavior. By feeding the extension’s clip into the ring on the opposite end, you can configure the extension into a checking training lead to banish pulling. A multi-function leash, like the Vario 6, might be ideal for someone who wants one leash with the occasional need to walk two dogs. It’s heavy duty design means that it’s extremely strong but, thanks to EzyDog’s proprietary super tough soft touch nylon, it’s still extremely comfortable and relatively light. It’s light enough for a single small dog but tough enough to handle two large or energetic dogs. It is also available in a LITE version for dog’s under 26 lbs. The Vario 6 is like the Swiss Army Knife of dog leashes, offering six unique uses. Aside from being a standard 5’ leash, the Vario 6 can be configured into: a 3’ traffic leash, hands-free leash, double dog leash, or can be used as a tether.